WordPress 5.0 was released at last year’s WordCamp US and introduces the new block-based “Gutenberg” editor. We’ve been super-excited about Gutenberg since then. Now that WordPress 5.0 is out, everyone is excited about blocks, but one question I keep hearing is “what about my shortcodes?” That’s a good question. We wrote an article last year about how shortcodes work with Gutenberg. We’ve been excited about Gutenberg for a long time. We were the first major plugin to add a block. 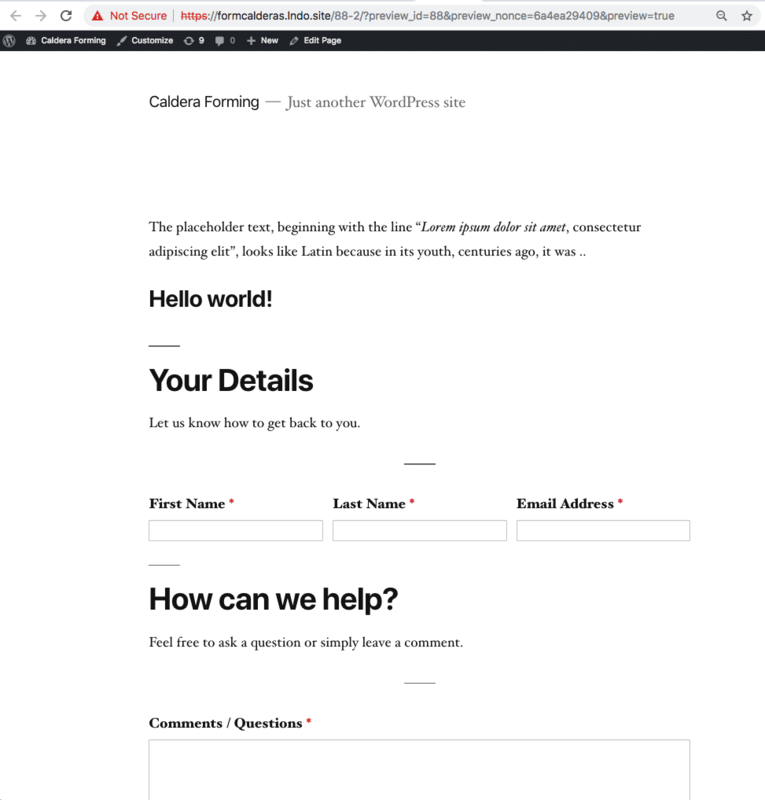 One cool thing about our shortcode was it loaded a preview of our form in the post editor. I wanted to make sure our block did the same. Because we were so early, I had to write my own solution. For Caldera Forms 1.8, we’re using WordPress’ built-in solution for previewing blocks that are server-side rendered — blocks like our Caldera Forms block. When I went to do this conversion for Caldera Forms, I could not find a great example outside of the official documentation. So, I decided to write a quick post about how to convert a WordPress shortcode to a Gutenberg block. It’s something I enjoy doing, and I hope it helps you. If you want to look at the pull request I wrote for Caldera Forms to implement the server-side rendering component for our block preview, you can see it here. At last year’s php[world] Zac Gordon and I gave an all-day workshop on Gutenberg block development and the example code is on Github. To get started, I added a shortcode to that plugin, so I’d have something to improve. Now we have enough to get started converting this shortcode to a block. You can download our example code at this point if you want to follow along, or you can use your own plugin that needs blockified. Creating and registering a block is something that has been covered very well elsewhere. My slides from my WordCamp Pittsburgh 2018 talk include examples and links. You can also take a look at the official documentation on creating WordPress blocks. Igor Benic has a great post that shows how to create a Gutenberg block for displaying a post that I would recommend, strongly. When I used register_block_type() to register the block, I told it about two attributes. They have the same names as the attributes my shortcode expects. Not deviating from what already exists makes this easier. But, there is an opportunity to map block attributes to legacy shortcode attributes if needed. Now that we have the attributes planned out, let’s start setting up the new block. All WordPress blocks start with the function registerBlockType(), we give it a name, an edit callback — to create the UI for the block — and a save callback to change what gets saved from the default — and attributes. Let’s start with the basic outline of a block that just shows some words in the block, where the preview should go. This is a start point, but this block should show up in the editor and display the static text from the edit() callback function. Now, let’s make the block editable. The example code plugin has two complete examples of blocks with editable attributes that you can see. Need help managing your WordPress site? Subscribe to our mailing list for more content like this! Because I want the block to look identical in the editor to the front-end, I will put my controls on the right hand “Block Inspector” area. Before we can add form controls to update the values of the attributes, we need to know how to access the attribute values and how to update them. Now I can use the WordPress component library to add a text control and select controls for the post ID and the heading level. I find that the wp-storify Storybook site is the best way to find the right WordPress UI components and see the README on how to use them. Now that the UI for the attributes is done, we still need to be able to preview the block. What’s cool is it will update in real time. Because we already have a function — from the shortcode — to display this block, the PHP render callback argument was used with register_block_type() to call a PHP function to display the block in the front-end. The render function just says hi from the server. I wanted to start as basic as possible. If you’re copying this code into your own plugin, you could put anything there. We’re going to use the same function the shortcode handler does. First, let’s get it working in the preview. Now in the post editor, my block shows “Hello From The Server” and it also shows that in the front-end when the post is displayed. That’s not what we want. With this in place, you should be able to skip through post/page IDs and see the titles load. And if you change the heading, it should update live in the browser right away. That’s the basics of converting a WordPress shortcode plugin to a Gutenberg block for WordPress 5.0. In this post, you got a walkthrough of the process of creating a block, making it editable and adding a live preview that’s identical to the front-end view of the block and created with a PHP function shared with the legacy shortcode. You can see the completed example on Github. This is open-source, copy what you need, please. If you wanted to take this further, and want a good challenge, I’d convert the simple text control for post ID to an autocomplete that searched for WordPress posts by post type. If this all sounds like fun, but you need an in-depth course before starting out with Gutenberg, Zac Gordon’s course is perfect for you. Zac starts at the basics and then walks through all of the new tools that are available to us to create really cool blocks. His course has a ton of great example code, which I reference all the time.